4Videosoft iPad 3 Video Converter for Mac is definitely your best choice, if you want to convert any mainstream video and audio file to your iPad 3 supported formats on Mac. Besides, it also provides some powerful editing functions for you, such as adjusting effect (brightness, contrast, saturation, volume and hue), specifying video length, cropping video frame, adding video watermark, etc. 4Videosoft iPad 3 Video Converter can convert all kinds of general video to iPad 3 on Mac, such as MP4, HD, MTS, AVI, WMV, MOV, VOB, etc. It can also extract audios from any video file and convert them into iPad 3 MP3, OGG, ACC, WMA and so on. 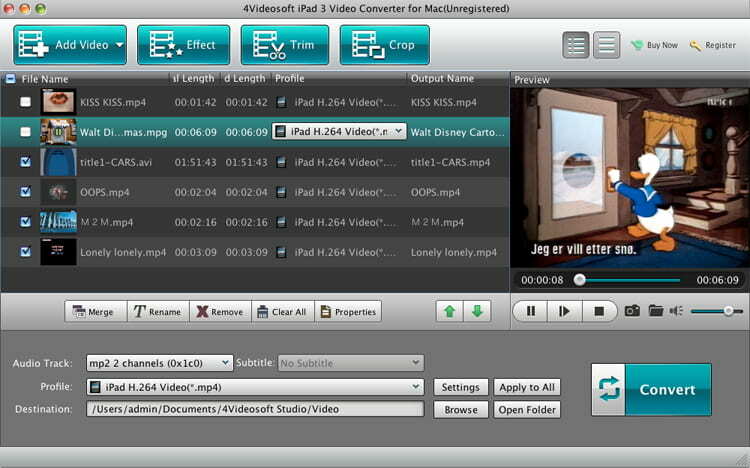 4Videosoft iPad 3 Video Converter for Mac allows you to optimize video effect. You can use it to adjust the video brightness, contrast, saturation, volume and hue. What's more, Cropping the video frame can create a perfect video screen for your iPad 3. You are allowed to clip the video length from the source video or merge several video chapters into one long movie and add video watermark in the form of text or pictures with this Mac iPad 3 Video Converter. As a professional converting software , 4Videosoft iPad 3 Video Converter for Mac allows you to difine the output settings such as the Video Encoder, Resolution, Frame Rate, Video Bitrate, Audio Encoder, Sample Rate, Channels and Audio Bitrate, and you also can save all the output settings as user-defined profile for the later use. The iPad 3 Video Converter for Mac is a built-in player, which means it can help users pefect the output video. You can also convert video for iPad 3, iPad 2, iPad, iPhone 4S, iPhone 4, iPhone, iPod and other Apple devices with this software. Besides , the intuitive interface and super fast converting speed can fully fit your needs.